Community Council Elections are open! Join us! Community Council elections are now open and we’re always looking for new members to join and make a difference in the community. Not got time for a councillor role? Why not join us at a meeting instead? Community Council meetings are held on the 2nd Monday of every month, at 7.30pm in the Hutchison-Chesser Community Centre on Hutchison Avenue. 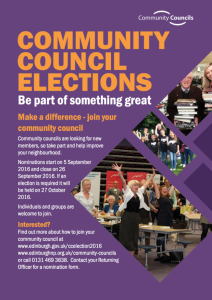 Download a Community Councillor Application from the Edinburgh Council website.